A Luger is an arm-locked pistol. It is semi-automatic, magazine-fed, and operates on the short-recoil principle. The pistol, designed by Georg Luger, was based of a design of Hugo Borchardt, which never saw the great success of its little brother. The Luger P-08 was the standard sidearm for the German army during both world wars, but it was in the process of being replaced by the Walther P38 at war's end. 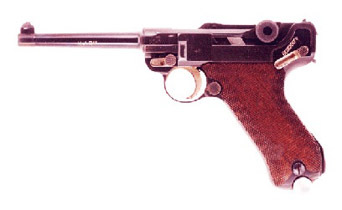 Although obsolete today, the Luger is still sought after by collectors both for its sleek design, and to a greater extent by its infamous connection to Nazi Germany. Thousands of Lugers were brought back as souveneirs by American GIs after WWII, and are still in circulation. Additionally in response to demand, modern look alike pistols are built by several companies. Operation: The Luger uses a jointed arm that locks in the extended position. Upon recoiling with the barrel, a cam strikes the joint, causing the arm to hinge and the cartridge case to extract, beginning the firing sequence again.